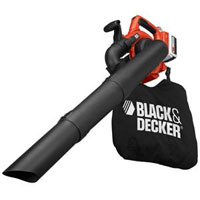 A lightweight, easy-to-maneuver device from Black & Decker, this cordless electric leaf blower does efficiently what a push broom would do: sweep hard surfaces of leaves and debris. It’s best used on patios, walkways, and garage floors; it won’t be able to handle grassy surfaces well. Relatively quiet and creating no emissions, this surface sweeper is a handy tool to have when you need to freshen up the outside of the house quickly. The $149 price is nice, too. The included rechargeable battery doesn’t last too long per charge, but if you have other cordless Black & Decker tools you can swap out the batteries easily.